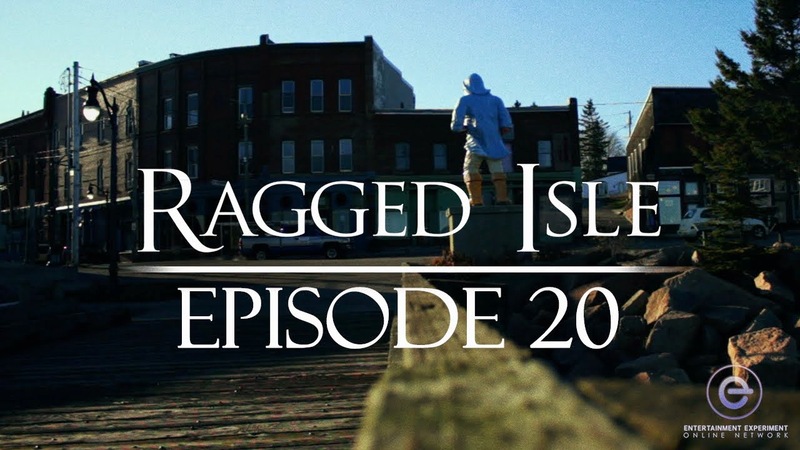 "Ragged Isle" episode twenty-one, "Are You Gonna Wait Forever? ", is up at The Entertainment Experiment web site. If you haven't already, go watch it now. After you've seen it, read on for a behind-the-scenes writer's commentary, which will (of course) include spoilers for this episode and previous episodes. 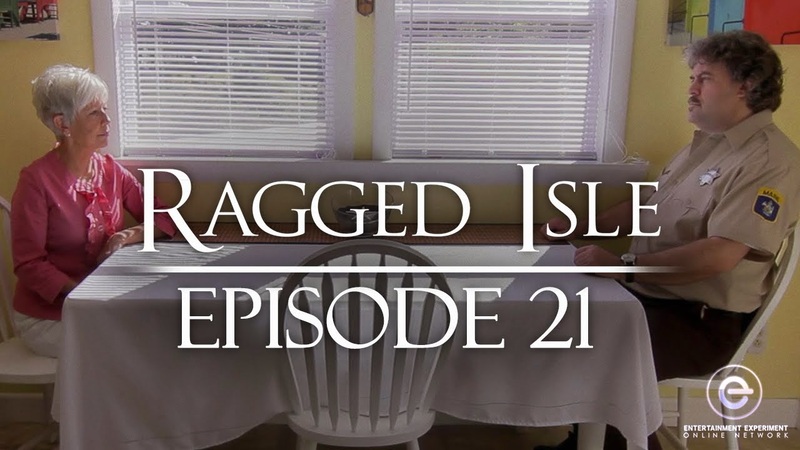 In "Ragged Isle," we've just learned that the main villain of the series, the one who's been killing people left and right, had a back story that helps explain (if not justify) his horrific behavior. That back story also reveals the other villains on the island, those of his kind who put him in that underwater cage with his human lover. In our writing sessions, we informally referred to these people as "the elders." In this episode, we learn, quite explicitly, how the elders also do not consider themselves to be villains. We've seen Rose's powers of persuasion before. In the first season, she convinced the town meeting attendees to carry on with the lobster festival (a decision that turned out to be disastrous). In the second season, she convinced a weary Gertie Kendrick to jump into the body of her poor doomed protégé, Trevor Stebbins (which didn't work out very well for Trevor or Gertie). In this episode, she tries to convince the sheriff that what the elders have been doing for centuries is somehow justified. This effort is doomed to failure, of course, as neither the sheriff nor the audience is likely to be convinced that taking over someone else's body (killing them in the process) is okay. But you can see why the creature calling herself Rose Fuller believes she's in the clear, morally. If you can't, consider the lobster (or whatever other animal you're recently consumed). Julie Katsarakis, always sunny and positive, has an unsavory history that was revealed in her Homeland Security interrogation in season two. In Rose's discussion with the sheriff in this episode, we learn the significance of that history. It turns out, Julie was chosen as a vessel precisely because she was a lost soul, someone who, without intervention, would not have thrived. The elder currently known as Rose reasons that if she cultivates a lost soul, she has the right to take over that soul when the time comes. No different than an organ transplant recipient using the organ of someone who no longer has use for it. The sheriff's counter-argument is that Julie may have been a lost soul, but now that her soul has been restored, she has the right to it. That's where Stephen King's quote above comes in. I have always loved this quote. (In an early draft, I even had the sheriff paraphrase it pretty directly, but this was roundly rejected as out of character.) The intrinsic worth of the clay. To the potter, the clay is just a tool, a means of achieving the finished product. But the clay itself has value all its own. The sheriff (and we) can see things from the clay's point of view. The elders cannot. 1) The opening scene is about as deliberately comic as we've ever gotten (with the possible exception of "Louszini"'s magic show). I love the pace of this scene, the rapid-fire exchanges, my own character's extremely condensed summary of everything that's been discovered, and the one last Aquaman joke courtesy of Deputy Dan (who delivered our first Aquaman reference way back in season one). 2) I wrote last week about how the parallel investigations are starting to intersect. I'm enjoying watching previously unpaired characters teaming up. Agent Thorne and Sheriff Dalton? You bet! Deputy Dan and Dr. Hoffman? Sure, why not? 3) An early draft of this episode had the sheriff enter Rose's house with his gun drawn, which makes a certain amount of sense, given the threat level. But a decision was made soon after that draft was written not to have any guns on this show. Now, the sheriff plays this scene like an unarmed hostage negotiator, and the scene is all the more riveting for it. 5) The final line of the line of the episode is decidedly meta, isn't it? Rose is (hopefully) voicing the opinion of everyone in the audience, everyone who has to wait for the last episode to see how everything turns out. (This is my favorite closing line of any episode since Madame Clelia's in episode seven.) The line is shamelessly cribbed from Kenneth Branagh's largely forgotten 1991 neo-noir Dead Again. The movie is pure hokum, but (mostly) pretty clever and entertaining and (at times) wildly over the top. It occasionally streams on Netflix, and the next time it does, you should check it out. 6) I cannot believe there is only one more episode of "Ragged Isle" left. It has been an amazing journey, from that December day in 2009 (when Barry Dodd asked me what strange things could happen on an island) to today, almost five years later, as we prepare to wrap up the series. The show has quite literally changed my life, and I'm grateful to have been a part of it. 7) I'm also grateful to you, the audience, without whom this whole endeavor would have been rather pointless. Thank you for following along on our story. I sincerely hope we've stuck the landing and you dig our ending. 8)"Rose, why is there a man chained up in your basement?" "Ragged Isle" episode twenty, "Original of the Species," is up at The Entertainment Experiment web site. If you haven't already, go watch it now. After you've seen it, read on for a behind-the-scenes writer's commentary, which will (of course) include spoilers for this episode and previous episodes. I've written about our process before. I'm talking about the five original writers: Barry Dodd, Karen Dodd, Rick Dalton, Jacob Lear, and myself. We had this giant piece of cardboard and these little index cards on which we wrote character descriptions and plot points, clustering them on the cardboard to form loose episode capsules. The first ten clusters, representing the first season, were thickly settled, as a large part of our energy and focus was getting the first season (which we'd be shooting that summer) really nailed down and into good shape. We knew the climax of the whole series, thanks to a brilliant offhand comment from Jake Lear early in the proceedings. But the clusters of cards between the first season and the climax were a little... thinner. For example, for the previous episode, we wrote that the "dissident" (which is how we referred to the character who fell in love with Emma Dobson and was exiled to an underwater cage) meets the CDC character (who would be played by me), realizes I'm his son, and tells me so. This is what it said on the card, more or less: "Dissident meets CDC agent. Tells him he's his son." When it came time to write that scene, I thought to myself: Wait, what? Why would the CDC agent believe this guy? Is there anything written on the back of this card? No? Damn it! After some thought, I hit upon the idea that unbeknownst to the CDC agent, he has the ability to breathe underwater. I wrote the scene that eventually ended up in episode nineteen, in which the "dissident" gives my character a bit of baptism, proving definitively that he's... well, not like other people. Brilliant!, I thought to myself, and happily shared the scene with the rest of the writing team. To my dismay, Karen pushed back against it. "I think that the CDC agent would have discovered this ability before now," she wrote. Rats! Wait, would he have? Why would he have? We went back and forth on this for quite a while, never quite fully agreeing, until finally, I wrote the monologue my character delivers in this episode, the one about his little brother drowning -- definitively serving up a reason why Dr. Hoffman has never discovered this amazing ability. Boy, am I glad Karen pushed back, because this is my favorite scene in the whole series (or one of my favorites, anyway). But, boy, was I terrified to actually have to perform it. First of all, I'd be sitting next to Michael Dix Thomas, who's basically great acting personified. Secondly, the tone of monologue is extremely tricky: sad, awed, and capping off with a laugh line about Aquaman that has to be delivered absolutely straight. I'll leave it to others to decide whether or not I pulled it off, but I've been waiting two years to share it with you. I'm so happy it's finally here. As for the rest of the episode, it has one of the creepiest endings of any episode of "Ragged Isle." I've mentioned this before, but the basement scenes were shot in my basement, which is just inherently creepy anyway, and the sight of a gagged and bagged Paul thrashing around on the chair just gives me chills -- even when I saw it happening on set and I knew Ian was just fine. Yikes. Also, I throw up again. Dr. Hoffman sure has a weak stomach. 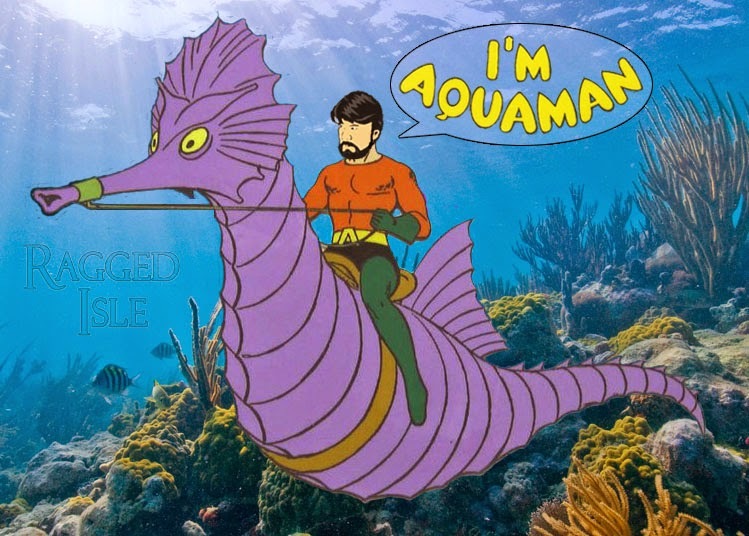 But now we know why he doesn't like boats. Or the water. The idea from very early on was that there would be simultaneous investigations happening on the island -- people taking a cold, hard, logical approach (Agent Thorne Homeland Security), people looking for a more supernatural explanation (Sheriff Dalton and Dr. Hoffman), and people digging into the island's history (Paul and Vicki). As we begin to wrap up the series, those supposedly parallel investigations are beginning to intersect more and more. It was fun to bring those separate elements together outside the Ragged Isle Star offices (to be continued next episode). We're really in the home stretch now, and for me, these final three episodes are the most exciting ones we've done. I can't wait to share the rest with you. P.S. Those underwater shots are stunning, aren't they? Barry and Derek and David's images are so beautiful. Haunting event. P.P.S. I keep thinking of other things I want to praise about this episode. How about Kip Weeks and Krystal Kenville acting underwater? Acting. Friggin'. Underwater. Holy cow, these guys are unbelievable.